We get a raid level STR polearm? This opens a whole new world of mogging for plate users. Only the fifth epic strength polearm since the game's launch, if I'm not mistaken. Quite a few people have been asking for something like this for a long time, and the devs have finally listened! On a side note, I wonder which Boris is this referring to, exactly? Accompanying piece: Kar-Loff, Terror in the Dark. On a side note, this weapon, as well as the Greatsword of Frozen Hells, have not yet turned up in the Dungeon Journal on the PTR. That's not to say that they won't, but the other 2h sword and the 2h axe off of Lei Shen are already in there, as well as all of the other 1h strength weapons. I assume Blizzard is still trying to decide which bosses to have these two drop from. This Polearm is confirmed to be a trash drop from Throne of Thunder, which is why it doesn't appear on any loot tables. 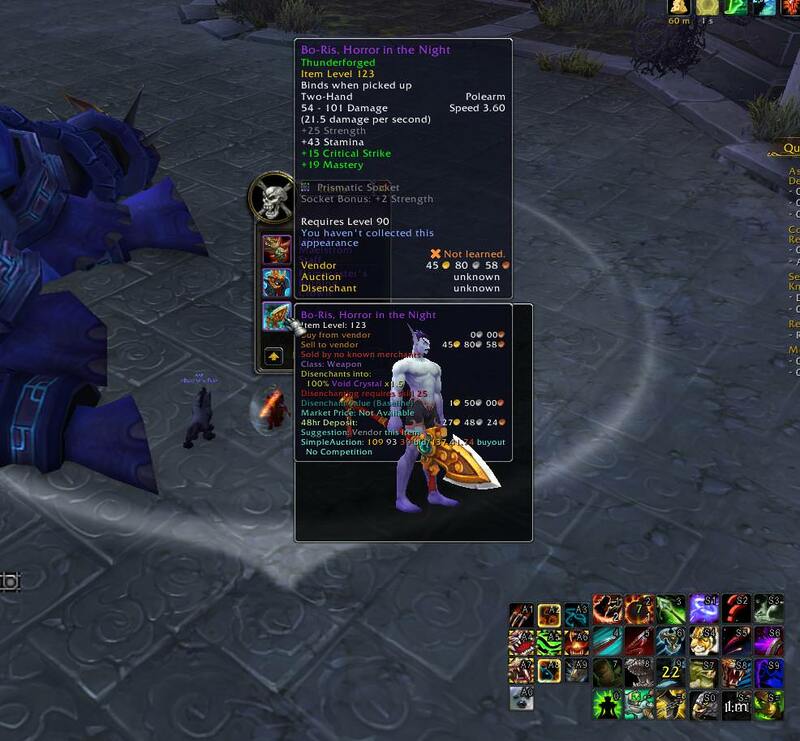 The LFR version can be rarely found inside Spoils of the Thunder King (the LFR failbag). "Normal drops trash loot (and there is no heroic trash). In LFR, you can get those pieces from the bags that only have gold today." Yey for Blademaster orc again! Everyone's all like "OMG STRENGTH POLEARM" and I'm all like "This is the polearm those huge mogu statues use"
Jin'rokh the Breaker dropped this for my guild last night (as standard boss loot, not a bonus drop or anything). Our DK tank was very surprised since it wasn't listed as being a drop from him anywhere. @JADORO Hey! Can we get a name/guild/server for the Lucky DK? WTB SCREENSHOT! Fun fact: this looks like the polearm that the enormous Mogu statues in Vale of Eternal Blossoms/the login screen use. Forgive me for asking, but, this doesn't drop on LFR? Is it even possible for a SV Hunter to farm Boris? Weirdly, this hangs in the hunter Order Hall. Sure, all weapons are hunter weapons, but I still find it odd. This can drop for hunters, ran on my hunter after reading comment from a guy that said he got it on his hunter, loot spec set to survival, not sure if it matters or not. providing picture for those who wants it before running on hunter https://i.imgur.com/3hmu1o5.jpg Much luck to you all that are still farming for this! What's the best way to farm it? 25m Normal? 25m Heroic?